"What you see on the news is a story 150 years in the making." Netflix has debuted the first trailer for the documentary title The 13th, or just 13th, directed by fillmmaker Ava DuVernary in secret over the last few years. It presents an in-depth look at the prison system and how it reveals the nation's history of racial inequality. The title refers to the 13th Amendment to the Constitution, which reads: "Neither slavery nor involuntary servitude, except as a punishment for crime whereof the party shall have been duly convicted, shall exist." This looks like it's going to be hard-hitting and provocative, and hopefully will cause changes. DuVernary commented that "this film was made as an answer to my own questions about how and why we have become the most incarcerated nation in the world, how and why we regard some of our citizens as innately criminal, and how and why good people allow this injustice to happen generation after generation." 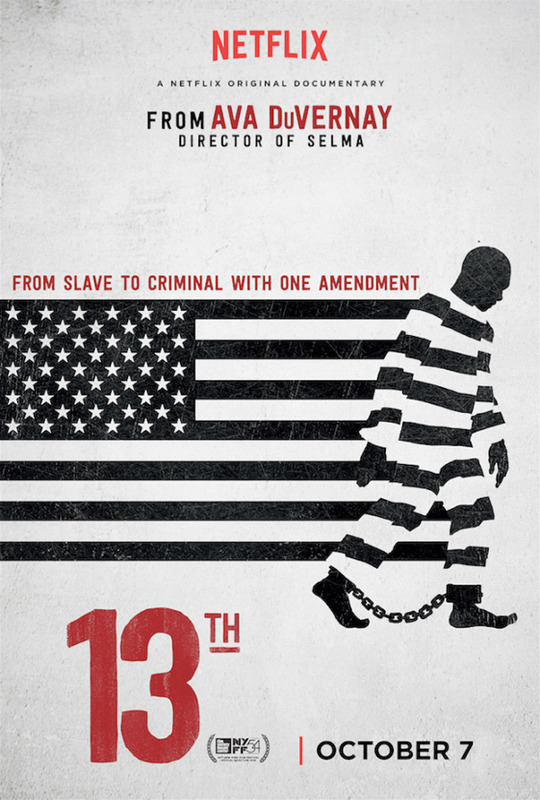 The title of Ava DuVernay's extraordinary and galvanizing new documentary 13TH refers to the 13th Amendment to the Constitution, which reads "Neither slavery nor involuntary servitude, except as a punishment for crime whereof the party shall have been duly convicted, shall exist within the United States." The progression from that second qualifying clause to the horrors of mass criminalization and the sprawling American prison industry is laid out by DuVernay with bracing lucidity. With a potent mixture of archival footage and testimony from a dazzling array of activists, politicians, historians, and formerly incarcerated women and men, DuVernay creates a work of grand historical synthesis. The 13th is directed by acclaimed filmmaker Ava DuVernary, of the films Selma, Middle of Nowhere and I Will Follow previously. This doc premieres at the New York Film Festival as the Opening Night feature this weekend. Netflix will then release DuVernay's The 13th starting on October 7th next month. Interested in watching? Powerful stuff, couldn't have come at a better time. Sure. Like we don't already have enough racial tension. Always good to educate people who ask , do black people really get shot by cops?? If we didn't have video cams, cellular phones, or camcorders it wouldn't be addressed. Also helps to educate ourselves on why we have reached this point.
" Also helps to educate ourselves on why we have reached this point." You missed my point. Educate ourselves on how we have reached this point. Black people aren't the only ones who get shot at, or shot, by the police. It might help if blacks weren't belligerent when being stopped and or questioned by officers. Blacks constantly complain that the police don't care what happens in their communities yet, when a crime is committed, no one saw or heard anything. How can you help them if they won't help themselves? Once again, when you state " if they won't help themselves" it shows how uneducated you are with the African-American plight. It's a shame that we do not educate ourselves on several issues. There are people in this country who are born into a situation where hope is a foreign word. It's o.k. , the majority of americans think and feel like you. It might help if blacks weren't belligerent when being stopped and or questioned by officers. With this comment it says a lot about how you feel. Have you seen the videos of African-Americans being asked to show their license and then proceed to get gunned to death while doing so?? Won't comment any longer. So the "African-Americal plight" gives them the right to disobey the law? Why does US police shoot on sight when they deal with black people ? Countless blacks aren't shot on sight...whites have been shot on sight. Pardon the obvious pun but stop oversimplifying this down to a black and white problem. I dunno. when you see people being shot while their hands are up, it's not reassuring. Maybe you should become a police officer and find out. Oficers put their lives on the line to daily. What have you ever done? Me? i put my life online daily. It's a risky business Bob. This is propaganda...not saying it's Michael Moore levels of propaganda but it's still a biased take on the problem. Crime and poverty are linked. What's disingenuous about videos like this is that it's trying to paint the picture that the majority of black inmates are innocent and simply rounded up as some form of modern slavery. The harsh reality is that crime IS a huge problem in the black community because of poverty. I've married into the black community and there are several people in my wife's immediate family who are felons...guess what...in both cases they committed the crime. We can debate the harshness of sentences but let's stop pretending like crime isn't a big problem for blacks. "Crime and poverty are linked". I Agree Discrimination and crime are also linked. A real world example...do you honestly think I'm going to read a 20 page document after I already stated I don't agree. You must have an example that can be summarized in a paragraph. Well in that case I'll just assume you don't have an example and therefor cannot back up your assertion. Sending a link to a massive document instead of writing 1 or 2 sentences not only seems like laziness on your part but a cheap form of deflection. I have already wrote the sentence you asked for in my post. "Recent studies, which focus on African Americans, point to interpersonal racial discrimination as an important risk factor for offending " This is the conclusion of researches led by researchers in sociology and anti-social behavior. so? That's not an example...that's someone simply using different words to state the same OPINION as you. That would be like me saying "global warming is a myth" and then I cite a quote saying "global warming is liberal nonsense". Cite me an actual example. There are countless hotly contested theories with well educated authors on both sides. That means nothing. Your reluctance to cite a single example isn't helping. I don't think you actually can think of one. Of what example are you talking about? the story of my neighbor who got profiled by police ? that's not a scientific approach. I gave you a study conducted on a large number of convicted people from different backgrounds and ages. Do you know how sociological researches work? Brilliant poster. // I must say Netflix is doing an amazing job at giving all kinds of docos a chance.